Black Pepper is a flavorful, medium hot spice used widely in cooking. It is made from the peppercorns of the Piper nigrum plant, native to South India. The green unripe peppercorns are boiled, dried and then ground into black pepper. A pepper grinder is recommended so you can grind fresh peppercorns to achieve the best flavor. Choosing: Black pepper is available whole, crushed or ground into powder. To ensure best flavor, buy whole peppercorns and grind them yourself in a mill just before adding to a recipe. 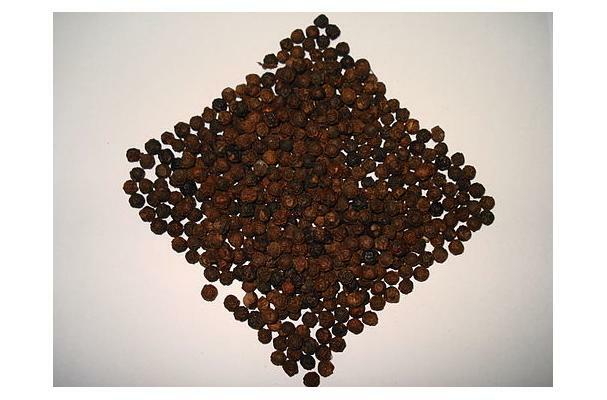 In addition to superior flavor, buying whole peppercorns will help to ensure that you are purchasing unadulterated pepper since ground pepper is oftentimes mixed with other spices. Whole peppercorns should be heavy, compact and free of any blemishes. Procuring: Pepper is a warm growing plant that will stop growing when below 65F and will not tolerate any amount of frost. Fortunately they make very good container plants. Pipers like to be in partial to full sun with 50% or better humidity (although they do fine below 50%) Plants should be watered thoroughly when soil appears dry. For peppercorn production, pipers should be grown under bright light and kept warm. They are vining in nature and slow growing. It will take a couple of years before they start producing flowers then peppercorns. Pipers are not prone to insect problems. The only disease problems are due to root diseases. It is important to keep pipers warm (above 65F) and to not keep wet or allowed to totally dry out. Black peppercorns were found stuffed in the nostrils of Ramesses II, placed there as part of the mummification rituals shortly after his death in 1213 BC. Little else is known about the use of pepper in ancient Egypt and how it reached the Nile from India. History: Native to India, pepper has played a very important role throughout history and has been a prized spice since ancient times. Since ancient Greece, pepper has held such high prestige that it was not only used as a seasoning but as a currency and a sacred offering. Pepper was used to both honor the gods and to pay taxes and ransoms. During the fall of ancient Rome, the invading barbarians were even honored by being given black pepper. Additionally, in the Middle Ages the wealth of a man was oftentimes measured by his stockpile of pepper.